I hope everyone is having a great summer so far and has a very happy 4th of July! As most of you know, my books are available on Smashwords as well as Amazon and many other book retailers. Smashwords is having their 9th annual Summer/Winter Sale beginning July 1st and running through the month of July. All of my books will be 50% off for the entire month of July! You can’t beat this deal, so check it out on Smashwords. Lately I have been expanding my own personal brand as a former CIA officer-turned-Mom. This means lots of surprises to come during the next few months. 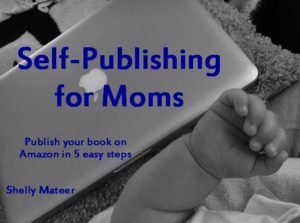 In response to finding myself getting a lot of questions about how to go about self-publishing a book I decided to create a short instructional eBook on how to self-publish on Amazon. It was a little experiment, to see if I could create my own PDF eBook, all by myself. Created for busy moms (or anyone who doesn’t have much free time) who have always wanted to be published authors! Check out the result on the eBooks page. Stay tuned in the months ahead! I have lots of surprises in store for you!